LG Electronics (Asia) President and CEO Woody (Y.W) Nam, arrived in, Sri Lanka last week to attend Abans Managers’ Convention 2009 at the Hilton Colombo recently. The Abans Managers’ Convention is an annual event where Abans recognize high achievers in their management who achieve their targets during the year. This year 40 managers were rewarded with all expenses paid tours to South Africa for the Champions Trophy ODI cricket tournament. The highlight of the convention was the launch of three new LG products. 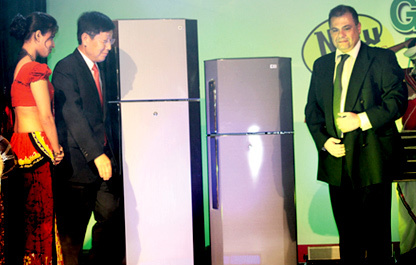 The launch of LG Green Ion Door Cooling Refrigerators took centre stage as this is one of most innovative new products which LG developed after years of intense research by LG’s advanced research and development team. To reinforce its already efficient energy saving and innovative Door Cooling Refrigerators, LG has introduced another unique feature for retaining enhanced food freshness. Green Ion Technology uses a ventilation system coated in catechins, a green tea extract, to deodorize the refrigerator. This, combined with a negative ion generator, kills food-spoiling bacteria and fungi, effectively resulting in no fungi after seven days compared to conventional models keeping food fresh longer than normal refrigerators. Next was the launch of Ultra Slim LG LH70 series LCD Televisions which are 1.6 inches thick, and packed with more advanced features than most LCDs, which make it the ultimate in High Definition viewing. This was followed by the launch of two new state-of-the-art LG Mobile Phones the LG “Arena” KM900 Touch Phone - the stylish phone with amazing features and the LG Viewty Smart GC900. Hutchison Telecommunications Lanka (Pvt) Ltd CEO Shankar Bali presents the first Rate Cutter to the most senior Hutch customer Ravi Fernando of Hotel Booking Services, at the inauguration of the Hutch Rate Cutter. 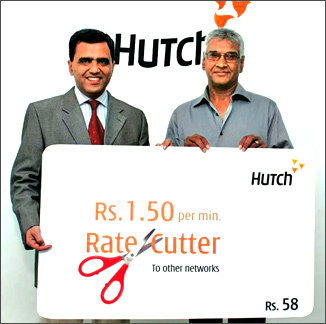 Mobile operator Hutch launched its Rate Cutter to the Sri Lankan market. The Hutch rate cutter offers customers the opportunity to make outgoing calls to other networks at Rs. 1.50 a minute for thirty days once purchased and activated. “This is the first time that the concept of cutting the tariff has been used creatively in promoting a company’s offering,” said Hutch General Manager Marketing Sanjaya Senarath. “We have always believed in adding value to our clients lives in novel ways and are proud to have done so again with the introduction of the rate cutter,” he said. “Our passion is to bring in simplicity and openness to communication which in turn will provide unlimited freedom to our clients,” said Hutch Sri Lanka CEO Shankar Bali. To provide convenience and continuous connectivity to its subscribers Hutch already connects incoming calls to subscribers who even have a zero balance in their accounts. This cost effective gesture has attracted a very positive and encouraging response from its subscriber base. You can rest assured that as we go forward we will come up with more creative solutions to make communication non restrictive; empowering our customers with true freedom of choice whereever they maybe, said Bali. Gateway offers more qualifications than any other children’s ICT program available in the world. Students receive certificates, validated by NCC Education, UK on successful completion of every level. Students also have a choice of receiving certification from the International Curriculum and Assessment Agency (ICAA) (endorsed by the University of Southampton) or the Cambridge International Examinations (CIE) or both at the successful completion of Key Stages one to three. Students who achieve Tiers eight and nine have the knowledge and skills to achieve the International Computer Driving Licence (ICDL) qualification awarded by the ECDL Foundation. Key Stage four coaches students for public examinations such as Edexcel OL/IGCSE Computing, Edexcel GCSE ICT, Cambridge OL/IGCSE Computer Studies and Sri Lanka OL ICT. Students can sit these examinations to achieve the relevant qualifications. Gateway’s courses are endorsed by Edexcel, UK, the organisation responsible for London OL and AL examinations. Referring to Gateway’s course material, Edexcel has endorsed them to be ideal preparatory material that provides everything students need to succeed at GCSE, IGCSE or OL Computer Studies and/or ICT. Gateway has also received commendation from the London Metropolitan University. A spokesman for the University said that they are pleased to support Gateway’s ICT training program for children. Having created a pathway to Gateway’s students to study ICT from Foundation Level (four years of age) to Graduation Level, Gateway continues to expand their presence locally and globally. With the two new destinations - Georgia and Myanmar, Gateway’s international reach now includes 10 countries in three continents. Over the years, Gateway in partnership with NCC Education, has introduced the program in China, Malaysia, Indonesia, Dubai, Pakistan, Nigeria and Bangladesh. In Sri Lanka, tens of thousands of children take Gateway’s program of study in 25 centres spread across the country. Gateway offers ICT education from Foundation (four years of age) to Degree Level. Through the Gateway Graduate School, which was launched in August 2008, the group offers students an affordable option of obtaining an internationally recognised degree in Sri Lanka. They also have the option of transferring to overseas universities in the UK, USA or Australia at the end of every academic year. Gateway Graduate School, in partnership with NCC Education UK, offers a career pathway to complete a Degree in Business Computing and Information Systems, here in Sri Lanka. Following the program of study at the Gateway Kids School of Computing, students are able to join the Foundation Program of NCC Education UK that meets the requirement of entering into the Degree Program. During the three-year Degree, students receive industrial recognized qualifications - Diplomas and Advanced Diplomas. The Royal Park Residence Hotel, a boutique styled, Sri Lankan managed hotel is ideally located in the heart of the diplomatic and newest commercial enclave of Banani, with a mere 12 minutes drive from the Dhaka International Airport. The Royal Park is the only ISO and HACCP certified hotel in Bangladesh. The five types of accommodation at Royal Park Residence have been furnished to provide ultimate relaxation, privacy and comfort and each are equipped with air-conditioning/heating, custom made carpeted floors, IDD from rooms and toilets, hi-speed wi-fi internet services, fire detectors and alarms, a pillow menu with a wide variety of pillows, hair dryers in all rooms, mini-bar (non-alcoholic), electronic safety lockers, 63 channeled digital LCD TV’s, DVD players, personal weighing scales, bath-robes and slippers. Business travellers will be delighted to learn that the Royal Park Residence provides complimentary airport transfers and a meet and greet service for all its guests. For those travelling with laptops - the property has ingeniously made available high speed wi-fi Internet connectivity in the entire hotel, be it rooms, dining spaces, terraces, lounges. The Royal Park is also equipped with a high capacity, automatic prime generator to ensure uninterrupted stream of power supply. The Elastomeric Group of Companies was awarded the ISO 14001 certification by the Sri Lanka Standards Institution. The Elastomeric Group commenced the development of documentation against ISO 14001 during the latter part of last year and has trained all staff in environmental management system concepts to achieve the maximum advantage through this certification. The Elastomeric Group which is a fully owned subsidiary of Hexpol AB, Sweden, consists of three companies. Two of these are engaged in the manufacture and export of polymer/ rubber based products mainly gaskets for plate heat exchangers, wheels for castors and industrial solid tyres. The Elastomeric Group being an ISO 9001 certified company decided to proceed in obtaining this certification keeping with the vision of the company and also to have an environmental friendly approach in conducting all its activities. Since the start up of the project, the company has achieved substantial benefits by implementing the ISO 14001 based environmental management system. The Company obtained this certification after a very stringent audit carried out by SLSI personnel as per international guidelines. Elastomeric achieved a new level of competence in relation to its environmental related activities through this management system. The Company has placed special emphasis and a very high focus for employees at all levels to understand the ISO 14001 system.